Tnfrsf11b (Opg) knockout mice were generated through homologous recombination and supplied by Shanghai Research Center for Model Organisms. This mouse model, which is referred to as the "osteoporotic mouse", shows a typical phenotype of osteoporosis and arterial calcification, and Therefore, this animal model is ideal for drug screening and evaluation for the treatment of "human osteoporosis", in gene therapy of osteoporosis, as well as in the research on the mechanisms of interaction between osteoclasts and osteoblasts. Osteoporosis is a systemic disease caused by the metabolic disorder of the bone. As an intrinsic contributor of ostealgia, hunchback, short stature, fracture, osteonecrosis, and disability, the incidence of osteoporosis is particularly high in the middle-aged and elderly population, whose health and quality of life are greatly impacted by osteoporosis. OPG is also known as the osteoclastogenesis inhibitory factor (OCIF). Clinical studies have shown that the polymorphism of OPG gene is associated with bone mineral density. OPG is encoded by the Tnfrsf11b gene. 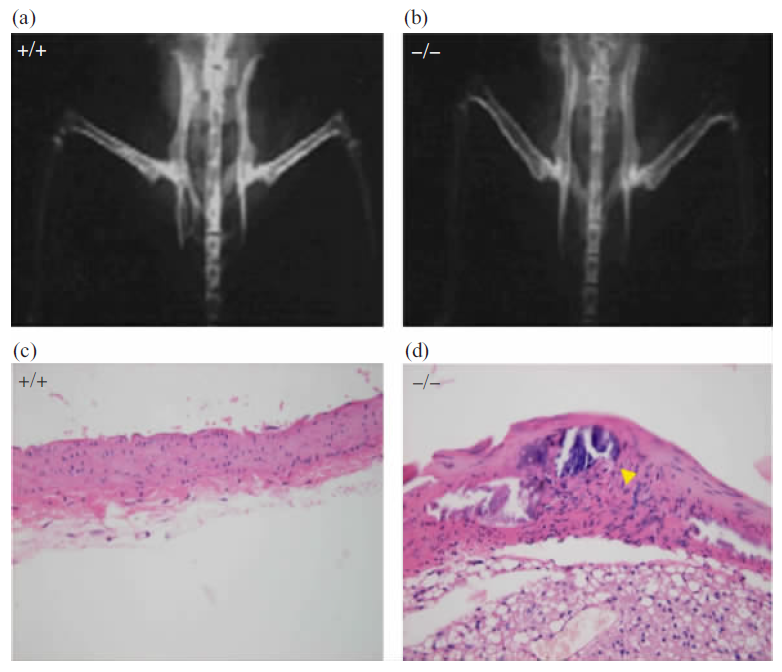 Using the gene knockout technology, Shanghai Model Organisms has established a Tnfrsf11b knockout mouse model, also referred to as the "osteoporotic mouse", that shows a typical phenotype of osteoporosis and arterial calcification, and hence can be used as an ideal animal model and novel research tool in drug screening and evaluation for the treatment of "human osteoporosis", in gene therapy of osteoporosis, as well as in the research on the mechanisms of interaction between osteoclasts and osteoblasts. Therefore, this animal model has both theoretical significance and strong applied value. Tnfrsf11b (OPG) knockout mice were obtained using the ES cell targeting technique. The full name of this mouse strain is B6.129-Tnfrsf11btm1Smoc, and its strain catalog number is NM-KO-00004. Under the examination by X-Ray, the mice with homozygous deletion of the OPG gene demonstrated the signs of osteoporosis. Histomorphometric analysis confirmed that the bone mass in the mice with homozygous deletion of the OPG gene was significantly reduced: the number of cancellous bone trabeculae was decreased, along with decreased bone connection and increased spacing among the trabeculae; the cortical bones became thinner and the number of bone lacunae was increased. The TRAP assay of OPG knockout mice confirmed that the number of homozygous osteoclasts (OC) in the mice has significantly increased. 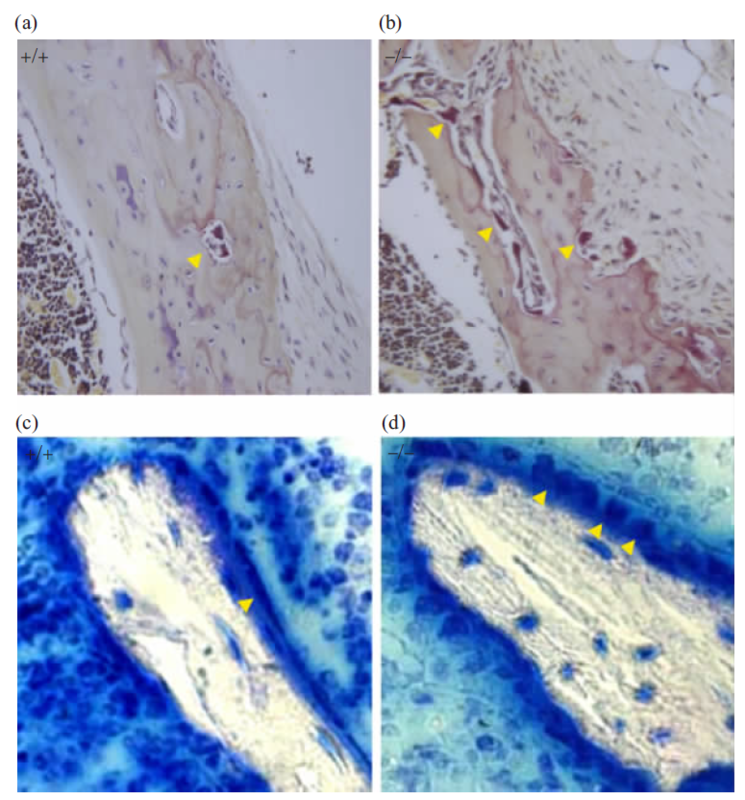 The OPG knockout mice also developed aortic calcification, which is characterized by the absence of atheromatous plaque formation and the presence of medial arterial calcification only. Fig1. Opg gene targeting strategy. (a)Schematic representation of gene targeting at the Opg locus. (b)Southern blot analysis by using ES cell genomic DNA digested with EcoRV. +/+:wildtype ES clone; +/-:Positive targeted clone. (c) Genotyping of Opg knockout mice by PCR. 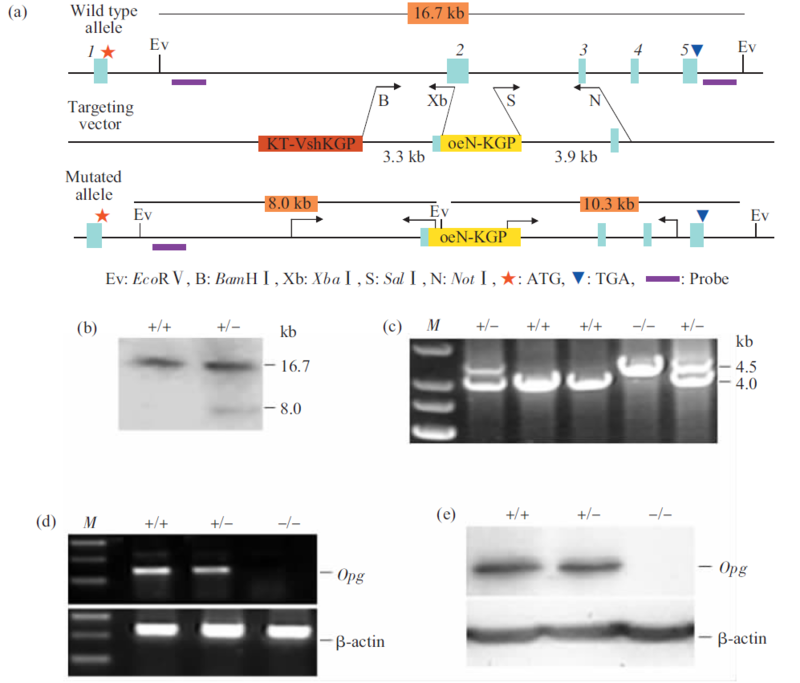 (d) RT-PCR and (e) Western blot analysis of RNA and protein from liver of wildtype(+/+),heterozygous(+/-) and homozygous (-/-) Opg knockout mice. The absence of Opg expression in Opg-/- mice was confirmed at both mRNA and protein levels. Fig3. High bone turnover in Opg-/- mice. (a,b)TRAP staining of femoral cortical shaft of wt and Opg-/- mice. Yellow arrowheads indicate TRAP positive osteoblasts. (c,d) Arrows indicate osteoblasts along the bone surface (H&E stained, 40x). Osteoblasts of Opg-/- mice appear more cuboidal in shape than those of wt mice. Xu Yong,et al. High-bone-turnover Osteoporosis and Aortic Calcification in Opg Knockout Mice. Progess in Biochemistry and Biophysics. (2007)34(3):260-266. Meizhu Yan,et al.Raloxifene inhibits bone loss and improves bone strength through an Opg-independent mechanism.Endocr (2010) 37:55–61.